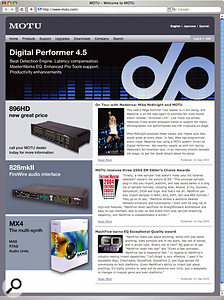 MOTU's pre-release screenshot of DP 4.5 in action. On show are the Consolidated Window with its multiple panes, and tabs for choosing between editing screens, the new Masterworks EQ plug-in, and one of the new Beat Detection Engine windows. We explain how to use DP effectively with Ableton's Live and offer a brief preview of MOTU's latest big update to Digital Performer, version 4.5. 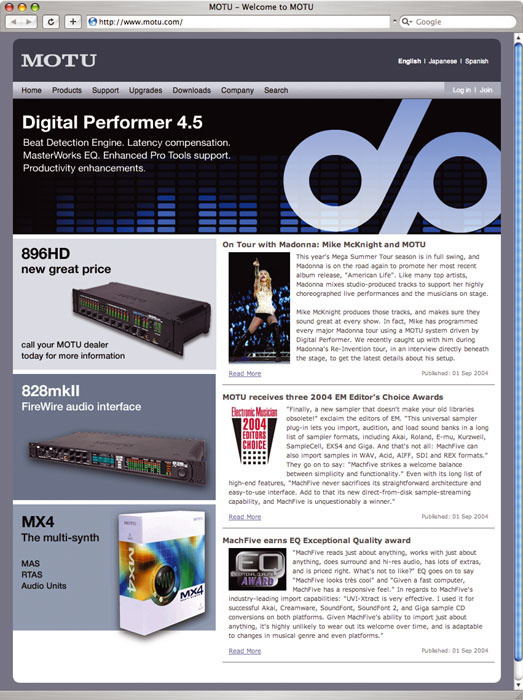 Although Digital Performer 4.12 has proved itself to be a productive and stable platform, it is, in the fast-paced world of sequencer development, getting a bit past it. So it was a pleasant and timely surprise when MOTU recently announced a big update to DP, version 4.5. The fact that it came on precisely the day that Apple announced Logic 7 couldn't have been a coincidence, could it? DP 4.5 should be available by the time you read this, offering some really ground-breaking features and hopefully tidying up some loose ends that have existed since DP 4.0. The upgrade cost for registered users is just less than £100, and you can get a brand-new copy for £249 by taking advantage of MOTU's crossgrade pricing. Perhaps just as useful will be DP 's new user interface improvement, the Consolidated Window. It'll be hard for anyone to ever again accuse DP of window 'sprawl', as now all the major editing windows, and the mixer, will be accessible from one window equipped with tabs for switching between views. There are also adjustable horizontal and vertical dividers, so that two or three individual tabbed windows can be visible at one time. This allows you to have the Tracks window and Sequence Editor (for example) top and bottom, with one or more Mixing Board channels off to one side. It seems such a simple concept, but I can't think of anything quite like this before. MOTU have certainly been clever in delivering the efficiency of single-window designs, such as Live or Traktion, but with the customisable nature that has always been a hallmark of DP. The other version 4.5 'biggy' is the new Beat Detection Engine. Where Cubase SX 3 delivers Live-style 'Liquid Audio', DP 4.5 goes down the Recycle route, of analysing the transient content of audio and splitting it into multiple slices. This doesn't help with audio transposition — that's still handled by the features I discussed in last month's Performer Notes — but for transient-based rhythmic music the slice approach is arguably better, as the individual transients are not subject to any time-stretching artifacts. Features related to the Beat Detection Engine include new slice-centric editing facilities, quantisation and 'velocity', so that the location and volume of individual transients can be easily manipulated. I'll be covering these new features, and more, including the new Masterworks EQ plug-in, Smooth Audio Edits and enhanced Bounce To Disk and Audio Export facilities, starting in next month's Performer Notes. Ableton's Live is one of the new breed of applications that, like Reason, aren't afraid to rethink some of the fundamental sequencing paradigms that were laid down in the 1980s by packages such as Performer and Creator. If you haven't already tried it, you have a treat in store — with its non-linear, 'Clip'-based approach, Live offers a refreshing level of immediacy, and its real-time pitch-shifting and tempo manipulation has to be heard to be believed. The software's latest incarnation, Live 4, has extensive MIDI as well as audio recording facilities, so it's possible to use it as your sole sequencing platform. However, using Propellerhead's Rewire technology, Live integrates nicely with DP, giving users a 'best of both worlds' approach and allowing Live 's abilities to supplement DP 's. The Rewire connection synchronises the two applications' transports, and provides 16 channels of inter-application audio from Live to DP. Unlike Reason, though, Live doesn't 'publish' its MIDI channels to DP, so initially it doesn't appear that you can either trigger Live 's clips from DP, or use DP to play virtual instruments hosted in Live. However, there is a workaround for this, which I'll discuss in a moment. Freeware MAS plug-ins are as rare as hen's teeth, but a great one has just become available. iZotope Vinyl, which, as its name suggests, aims to make your tracks sound like they're being played from a turntable, is available from www.izotope.com. If you haven't been over to www.motu.com for a while, it's worth a visit — the site has been redesigned (see screenshot), and a new user login system seems to promise some sort of community or forum for the future. Intriguing! A few months ago I mentioned apulSoft's Wormhole, a plug-in-based system that allows multi-channel audio to be passed across an Ethernet network with no loss of quality and very low latencies. Now there's MIDIoverLAN, which promises to do the same for huge quantities of MIDI channels, and with better timing accuracy and lower jitter than can be achieved by hardware interfaces. It's insanely easy to use, it could make multi-computer, software-based systems a lot easier to handle, and at $129 it's a lot cheaper than buying a multi-port MIDI interface. More details and a free demo from www.musiclab.com. The easiest way to run Digital Performer and Live simultaneously is to just go with the basic Rewire connection and run their sequencers in parallel, working on your Live song alongside a DP sequence. This is straightforward, except for when any large-scale structural edits are necessary, in which case you have to apply the edits separately for each application. 1. Open DP and create a new Project, or open a pre-existing Project. Enabling an input for Live before you open it is what causes it to boot up in Rewire slave mode. It's also possible to use Live as an elaborate kind of sound source. 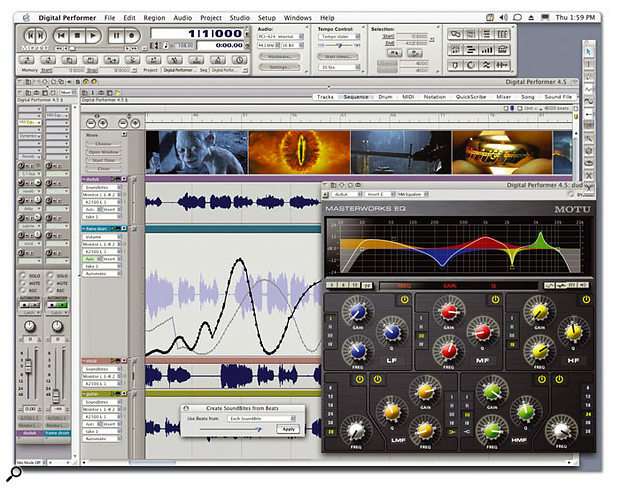 Live 4 has a couple of software instruments, Simpler and Impulse, built in and, like previous versions, can have dozens of clips arranged in the Session View. It's possible to 'play' Live 's instruments or trigger its clips from DP, even though Live 's Rewire implementation doesn't make provision for this. The workaround is to use DP 's Interapplication MIDI features. After starting up DP and Live, as described above, you go to DP 's Setup menu, choose 'Interapplication MIDI...' and add an output, naming it something like 'MIDI from DP '. This can potentially carry 16 channels of MIDI data; if you need more MIDI than that, you simply create another output. Via OS X's Core MIDI structure, these interapplication outputs are now seen by all other MIDI applications, Live included. To play a virtual instrument hosted in Live 4 from a MIDI track in DP, first go to the MIDI track in Live, choose 'MIDI from DP ' in the input-type pop-up menu, and a single channel in the input-channel pop-up menu. Then turn Monitor for the track 'On'. In DP, choose 'MIDI from DP ' and the same channel under a MIDI track's output pop-up menu, and then record-enable the track. You should now be able to play the Live instrument directly from DP. You might also want to go to the Studio menu, choose MIDI Patch Thru... and make sure 'Patch Thru in Background' is selected. That way Live continues to receive MIDI from DP even when DP is running in the background. By triggering Live clips from DP it's possible to take advantage of Live 's audio-manipulation features without using its sequencer, although parts of this process are a little fiddly and there's a lot of info you need to keep on top of! The general idea, though, is that you use Live 's MIDI-mapping functions to assign specific MIDI notes on individual MIDI channels to trigger a clip slot. These notes can be 'played' in a MIDI track in DP, routed to Live via one of your Interapplication MIDI outputs. This method will certainly work, but if you have many clips to deal with there are a lot of note numbers to remember, and editing clip playback order in DP can become a very abstract experience! You also have to think carefully about clip trigger modes in Live, and of course you lose the flexibility to dissociate clips from their default settings when necessary, as is possible in Live 's Arrangement view. However you choose to integrate the two applications, the DP/Live combo can do some really nice things. One that I particularly enjoy is using DP as a writing tool, then bouncing loop-length sections from it to disk, exporting them as AIFF files and importing these loops into Live. Once they're there, you can use clip envelopes to easily wreak all kinds of havoc that would be almost impossible to achieve inside DP. Even basic clip transposition settings can help pep up some loops, especially those that are essentially unpitched — downward transpositions, in particular, can instantly impart a 'lo-fi' feel. Whether you then export back to DP for the final arrangement is largely a matter of personal choice. I also find that Live is ideal for the 'groove' — handling rhythmic loops, building weird, pulsating ambiences, and integrating repetitive structures of all kinds — with DP hosting more linear parts and intricate MIDI programming work.